At this time of year, I receive several questions on the Rules from subscribers in the Northern Hemisphere, for which there are no definitive answers. The reason being, they concern situations that may or may not be covered by Local Rules, which form part of the Rules of Golf. Although I have covered this subject in more than one previous blog, it is obviously an important one and bears repeating, because it is obvious to me that some players do not realise that Local Rules, established by Club or Society Committees under Rule 33-8, can vary considerably. It depends on the precise wording of the Local Rule. May a player take relief from a ball that is embedded in the rough? It depends whether there is a Local Rule in operation that extends such relief from closely mown areas only, as in Rule 25-2. If winter Rules are in operation, may a player remove mud from their ball at rest in the rough? (Edited 28th November 2014) It depends whether there is a Local Rule that permits a ball lying through the green to be marked, lifted, cleaned and replaced without penalty. Note that some Committees incorporate this into a Local Rule on preferred lies through the green (i.e. not just from closely mown areas), where a ball may be lifted, cleaned and then placed (or dropped) within a specified area (e.g. 6 inches or a score card width). The latter is not recommended and is not approved by the R&A. If my ball comes to rest on an aeration hole on the putting green, do I have to replace it on that hole? Yes, unless a Local Rule states otherwise. May I use a distance measuring device during my round? It depends whether there is a Local Rule in operation that permits their use. May I take relief from damage made by course maintenance equipment that is not marked as GUR? It depends whether there is a Local Rule in operation that permits such relief. May I take line of play from sprinkler heads at the side of the putting green? May I take relief from crushed stone cart paths? It depends whether there is a Local Rule in operation that declares crushed stone cart paths as integral to the course. How do I proceed if my ball in flight hits an overhead power line? It depends whether there is a Local Rule covering this situation. Do I have to take relief if my ball lies in an area marked as ground under repair? Only if there is a Local Rule in operation that makes it mandatory to take relief. P.S. I strongly recommend that, where relevant, Committees follow the specimen wording in Appendix l to the Rules of Golf when making Local Rules for local abnormal conditions. A colleague has just pointed me to a couple of questions which I believe the answers are faulty. 1) If winter Rules are in operation, may a player remove mud from their ball at rest in the rough? It depends whether there is a Local Rule in operation that permits lift clean and place through the green (and not just on closely mown areas). The LR permitting mud to be removed from a ball (App I part B 4b Cleaning Ball) specifies that the ball may be lifted, cleaned and [b]replaced[/b]. The Preferred Lies LR (App I part B 4c), which permits [b]placing[/b] is only available in a closely mown area. The words 'more restricted area' means within a closely mown area, not through the green. 2) If my ball comes to rest on an unmarked temporary green do I have to take relief from it? It depends whether there is a Local Rule in operation relating to temporary greens. A temporary green if prepared for putting (ie mown and with a hole) is by definition, a putting green, whether marked or not. If it is not in play, it is a Wrong Green. If the temp is in play, then the closed normal green is a wrong green. This has been confirmed by the R&A. Incidentally, the USGA have expressed support for the idea of deeming wrong greens as GUR play prohibited as it make it easier for players to not have to worry about the stance relief not being included. Thank you for your questions, which only go to highlight how carefully players must read the Local Rules before commencing their round. 1) In my experience, many Committees introduce temporary Local Rules for lift, clean and place (or drop) through the green (i.e. including areas of rough) for non-handicap counting competitions, when course conditions are unfavourable. They are not restricted to the words used in the specimen Local Rule in Appendix l, Part B. 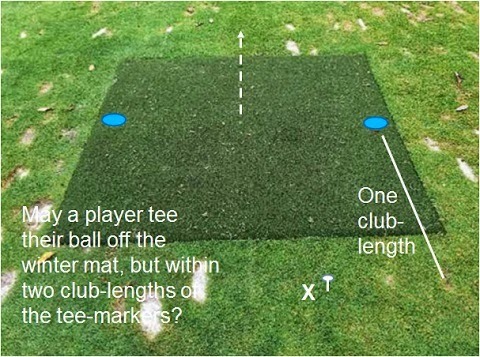 2) Similarly, I am aware that some courses identify small areas (usually circular) in front of the approach to putting greens to use during times of adverse course conditions (e.g. light frost). These do not meet the Definition of a putting green as they are not "specially prepared for putting". If these areas are unmarked and are not identified by a Local Rule, they are through the green and players may play strokes from them. However, to avoid confusion I have now removed this point. If you would like to continue this correspondence pleas email me at rules at barry rhodes dot com. When the siren is blown due to lightning, must players mark their balls and stop play or may they finish that hole. Plus is there a penalty for not ceasing play and deliberately playing beyond what is expected eg. extra holes. The penalty for starting play of a new hole after the Committee has suspended play is disqualification. Re my point 1 above. The R&A have specifically said that a local rule permitting preferred lies through the green would not be an approved local rule. The R&A have said that a local rule permitting preferred lies through the green would not be an approved local rule. Thanks, I have now edited this point above to take into account your comments. However, it does reinforce my main point, which is that players must familiarise themselves with the exact wording of Local Rules before commencing a competitive round.